The Alien franchise has had its fair share of ups and downs since the first film in the series was released in 1979. In 2012, Prometheus left fans divided, with many praising the prequel for its beautiful cinematography and its expansion of the Alien universe into new territory, while others criticized the hollow exploration of human existentialism, the poorly written characters, and the unfulfilling nature of film's conclusions. Alien: Covenant has followed in the same vein, I'd say, as reviews are relatively mixed among fans and critics alike. There's one thing, though, that I think everyone would agree on: both Prometheus and Alien: Covenant are prime examples of Ridley Scott's excellent visual world-building. I recently went to see Alien: Covenant and while I wasn't completely blown away by the film, one thing stood out to me above all the blood and xenomorph action: Ridley Scott's creation of cohesive and visually-stunning worlds (both literal and figurative) for his story to take place in. Everything from the machinery and weapons the characters use, to the vehicles they drive, the technology they have at their disposal, and the species they interact with, all mesh together to immerse the audience in the consistent and grounded world that the characters occupy. Ridley Scott was the director of the first Alien film and while he didn't return to direct any of the sequels, he very much set the tone and the direction of the franchise. Scott's return to the franchise with the prequels Prometheus and Alien: Covenant allowed him to revisit the world of Alien in a new way while maintaining narrative connections to the first film. As both Prometheus and Covenant take place decades before the events of Alien, Scott had some freedom in terms of what this new story could look like. What we get with Prometheus and Covenant are two films that are similar in style and atmosphere. Part of the new style of these two films is their grounding in a more realistic-feeling universe. Scott keeps the technology closer to things that we see today, particularly in terms of weaponry and vehicles. If we, as the audience, are able to feel like the events of the film are taking place in a plausible version of the future, it is far easier to suspend our disbelief and really become engaged in the world of the story. 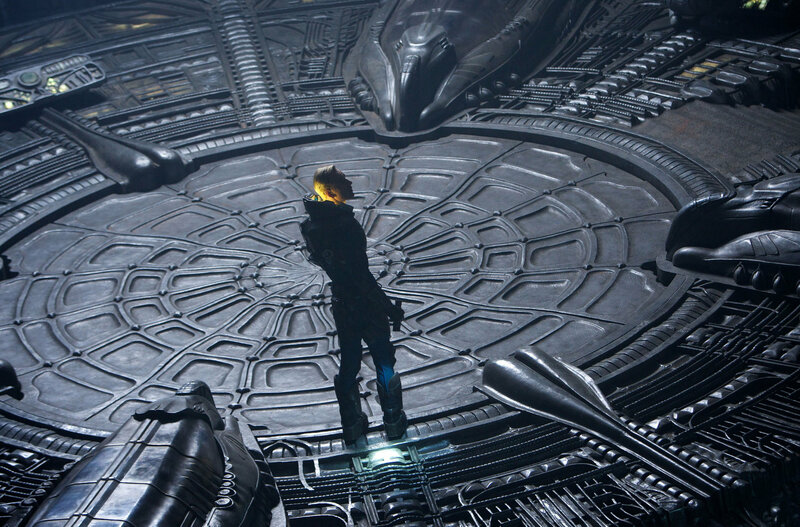 Another key aspect of Ridley Scott's world-building is his use of big sets and practical effects. While CGI is obviously needed to fill out a lot of the details of these larger worlds and to create things visually that wouldn't be possible otherwise, Scott remains a believer in large set pieces. Not only does this give the actors more to work with, enhancing their performances, but it feels more real to the audience. While CGI has come a long, long way in recent years, audiences can still generally tell when something is real and when it's computer-generated. By building large, intricately-detailed sets and using CGI to further enhance what's already there, extending practical areas into larger shots, and adding new layers, Scott is creating a universe that feels tangible and real. As a point of comparison, some of the set-CGI combinations used in any one of the films in The Hobbit trilogy are almost laughably bad. The Hobbit films are, of course, meant to have a very different tone and feel than anything in the Alien franchise, but if you watch any one of them again you'll notice that it's remarkably easy to tell where a set ends and where the CGI begins. When audiences are not able to suspend their disbelief, they are brought out of the world of the film, which takes away from their overall experience. To use a term popular amongst screenwriters, the world lacks verisimilitude. Put another way, people are unable to suspend their disbelief because what they're watching doesn't appear to be– or feel like it could be– real, either in terms of reality or within the confines of the narrative world. By building large sets and bringing care and precision to the practical effects, Scott has avoided this, making sure that audiences remain engaged and in a constant state of belief. Lastly, Scott also makes excellent use of on-location shooting to build his alien worlds. To create the setting of Prometheus, a distant moon dubbed LV-223, Scott used the striking scenery of Iceland as his backdrop. The waterfalls and the black sand, rocks, and cliffs combined with a little CGI to add in some alien structures allowed Scott to create a visually stunning and entirely believable world for the characters to occupy. Similarly, Scott relied heavily on the breathtaking scenery of New Zealand to create the unknown planet that is the primary setting of Alien: Covenant. Scott allows the environment itself to become a character and very much uses the natural beauty of the location to craft a more engaging story. While both Prometheus and Alien: Covenant had their flaws, Ridley Scott's ability to construct worlds and engage audiences in these worlds is worthy of praise. Done also to similar effect in some of his other works including Bladerunner and The Martian, Scott shows with these Alien films that he has a real skill for crafting plausible and believable worlds. By keeping futuristic technology grounded and consistent and through the use of large sets, natural landscapes and skillfully-employed CGI, Scott has brought his Alien vision to life. Even though some aspects of Prometheus and Alien: Covenant were disappointing, I'm excited to see where Ridley Scott can take us next in the planned future instalments of the Alien franchise.